'Sole Survivor' Live Blog Jan 9, 2014 - 5:00 PM EDT There have been 14 major airplane crashes with a sole survivor in the history of commercial aviation. Most of the lone survivors -- like Bahia Bahari, survivor of the 2009 Yemenia crash -- are dealing with debilitating guilt that few can understand. These survivors have never met each other, until now. "Sole Survivor," written and directed by Ky Dickens, premieres on CNN on January 9, 2014. 'JFK' Live Blog Nov 15, 2013 "The Assassination of President Kennedy" will explore the key conclusions of the controversial Warren Commission, as well as the shocking impact of the assassination of President John F. Kennedy, ahead of the 50th anniversary on November 22. ‘Pandora’s Promise’ Live Blog Nov 6, 2013 Pandora's Promise, a 2013 documentary, explores the potential of nuclear power to combat the worldwide crisis of climate change. The documentary debuts Thursday, November 7th at 9 pm ET on CNN. "Blackfish" Live Blog Oct 28, 2013 It was one of the hottest films out of the Sundance Film Festival, but "Blackfish" will leave you with chills. Critics have praised "Blackfish" for being an "emotionally powerful" and "mesmerizing psychological thriller" that could double as a teaching tool. 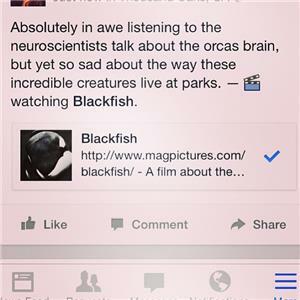 Thank you for watching CNN Films' documentary "Blackfish" for more information, please visit cnn.com/blackfish. Test Event 2 Oct 11, 2013 - 9:52 AM EDT This is just another test event again.